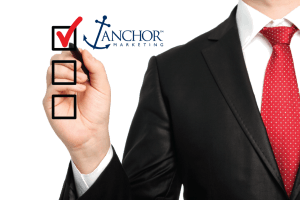 At Anchor Marketing, we will only recommend investing in promotional items under certain circumstances. We believe the value is determined by the group receiving the items and/or the uniqueness of the event where they will be given. 1. Only use extra funds set aside for specific marketing purposes or industry-related events. We call these “bonus” dollars, because promotional items should be considered a “bonus” or the “icing” to your already-determined marketing plan. 2. The item should be useful and/or make someone smile or feel good. 3. Choose an item that relates to your business or to the likes of the receiver. 4. If you prefer an item that is clever, or unique do not make it too hokey or silly unless you’re targeting children. Remember, these items with your name on them are a reflection of you and how you conduct your business! 5. There is no point in doing anything so cheap that either the receiver doesn’t want it or will throw it away. It actually transmits a poor impression of you and your business! 6. Present the items properly and in the right context. Display or distribute them in a unique way and or hand deliver with a smile. 7. Say “Thank You!” This is a perfect reason to give a client a promotional item with your company name. Remember though, the value of the Thank-you has to match what you are thanking them for! 8. Stay Top-of-Mind. This is another great reason to use a promotional item. The more you make contact with your clients or prospects, the more communication you will receive from them in return. 9. We cannot stress enough that the item you give is a reflection of you and your business. If you would not want this item for yourself, a child or a friend, do not brand it with your company logo. 10. The Home-Run: How do you know you’ve done a good job with your promotional items? They will ask you for more! Trade show items that have people attracted to your booth – just for the give-aways – are a Big Win. Likewise, if you find people still using the same item after one year, then Bravo!